The Ersatz M10 Panther is a gift Rank III German medium tank with a battle rating of 5.7 (AB/RB/SB). It was introduced in Update 1.75 "La Résistance" in the 2017 "Festive Quest" that took place between 22 December 2017 to 22 January 2018. It was obtained via completing 13 tanker's Christmas toys. The Ersatz M10, built on the purpose of mimicking the American M10 tank destroyer, will present external features to fit this purpose. Performance-wise the Ersatz M10 has the standard Panther's high-power 75 mm KwK 42 gun with the armour layout of the Ausf. G, but the automotive power of the Ausf. A. The Ersatz M10 has a steel structure around the base armour that transforms the outside look into a mimicry of the American M10 tank destroyer. The Ersatz's gun mantlet is curved shape like on the Panther A and D instead of the "chin" version on the Ausf. G. One of the customizable camouflage "Ersatz M10 Panther" is extremely sly by adding American markings on the tank without the usage of decal slots, with a white star and circle on the front hull, turret sides, and roof, as well as miscellaneous unit marking of the US 5th Armored Division, 10th Tank Battalion. The front of the Ersatz "M10" has been mocked up to look like the front slope of the M10 with its transmission housing. The hull machine gun cover on the armour cover is off, showing the machine gun that the M10 did not have, perhaps one of the most noteworthy feature from the front view distinguishing the Ersatz Panther from the M10. The features on the side is the best way to tell the Panther apart with with the wheels, of which the Panther presents the Schachtellaufwerk interleaved wheel suspension instead of the M10 bogie suspensions. Otherwise, the sloped side armour and the steel structure hanging off the edge looks the part of the M10. The Panther is also a good length longer than the M10 hull. The hull rear is also well disguised with the Panther's distinctive rear slope in the armour covered by a steel structure, the only feature noticeable is the engine exhausts coming out the top of the hull structure rather than from the bottom. The Ersatz "M10" turret is also a good indicator in distinguishing the M10 from this Panther mock up. The only similar layout to the M10 on the Ersatz is the gun mantlet, with its prism shape, though it is a lot wider and smaller than the American's M10. Even then, a hole on the Ersatz's gun's right side is a giveaway as this is the hole for a coaxial machine gun, something that the M10 did not have. The Ersatz's turret sides is added on with flat steel structure to imitate the M10's welded turret side, but the Ersatz "M10" sides are long flat plates while the M10's turret are distinctively pentagonal shape. The turret rear is then a big giveaway as exposed bits on the Ersatz's steel structure shows the Panther's turret with its rear loader hatch. As such, even though the hull rear may be immaculately matching, the turret rear is not. 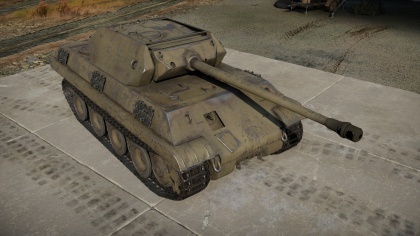 Finally, the presence of a turret roof is another giveaway as the M10 has no turret roof. A method the German used to hide this fact from a ground level view is the removal of the Panther cupola, decreasing the Ersatz's profile somewhat. Wheels are interleaved and can provide layered 20 mm armour. Belly armour front part is 18 mm thick while the back part is 15 mm thick. The Ersatz M10 can be played by its mobility or its firepower, along with its frontal armour, in a movement battle or a sniping battle. Both actions can be interleaved for a flexible fighting style on the battlefield. The Ersatz M10's basis of a Panther has a rather high top speed for its weight, along with its stable suspension, and so it can be used to get towards locations not typically expected of a vehicle of its calibre. It can be decided to move up to the direct front of the fighting or the flank locations. Moving up front favors an assault/brawling style of fighting and so the mobility, armour, and firepower is emphasized to resist surprise encounters in the front and take down defenses quickly and efficiently. 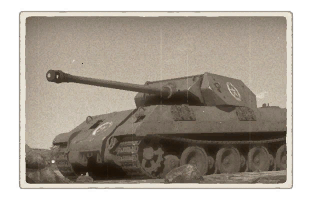 A benefit the Ersatz has over its fellow BR 5.7 Panther D is its fast turret traverse, making reactions to enemies much faster. Make sure allies are present as the Ersatz's side armour are very weak to enemy flanking fire and the relatively slow reload rate would desire an additional gun to protect the Ersatz during these down times. Be very cautious when moving up in enemy territory as the Ersatz's poor reverse speed will make extraction from a dangerous situation nigh-impossible, with the more preferable action being a fighting last stand in the worst case scenario. An Ersatz moving through the flanks will put it into a prime location for sniping fire away from enemy focus, while utilizing distance as a secondary protection against enemy fire, which could lose enough penetration to not go through the front glacis. The Ersatz's 75 mm gun is powerful enough to use in a sniping manner, with a small shell drop-off by distance that gives range estimation a smaller margin of error. As such, while the allies push up towards an objective, the Ersatz can stand back in an overwatch position and look out for enemy tanks that are approaching. The Ersatz can then use its long reach to attack these enemies as they are more focused on allies than the far-off Ersatz. Even in cases when the 75 mm will not penetrate, it can provide cover fire so that the enemy would not risk moving in fear of being nailed by a high-velocity 75 mm shell. Standing far would also be able to make the most of the front armour with the aformentioned penetration drop by distance. However, beware that the enemies would then try to target the turret and knock out the gun or turret crew. There are a number of vehicles to take caution of in enemy sides. At its BR, the American mediums of M4 Shermans are not too hard to defeat, but the 76 mm guns are powerful enough to penetrate the turret front through the flat sections or the gun mantlet. The M4A3E2 (76) Jumbo can resist the 75 mm from the front, but weak points like the transmission, machine gun port, and hull sides are targets to shoot to destroy. The M18 Hellcat is a definite worry as their fast speed and play style would favor attacking the Panther on its flanks. It would also have access to the APCR ammunition which can increase its lethality if the enemy player knows how to use them. At higher BR, the American heavies of T29 and T34 are of higher concerns due to their great front armour and high firepower that can penetrate through the Ersatz's front armour. Without access to APCR ammunition, the Ersatz can't exploit the flat gun mantlet on those two heavy tanks, resorting to very clever placements in the turret with the default APCBC or the front lower glacis for a frontal encounter. Any British tank that fires APDS can penetrate the upper glacis. The 17 pounder can sometimes go through the lower glacis at shorter ranges too. Any standard AP or APHE shell of a caliber above the 80-90mm range (aka 100mm and above) will penetrate the Ersatz M10 anywhere frontally. During the planning of Unternehmen Wacht am Rein (Operation Watch on the Rhine) in late 1944, the battle plan for the offensive that would later become famous as the "Battle of the Bulge", SS-Obersturmbannführer Otto Skorzeny, an SS commando most famous for his break-out of Benito Mussolini from Allied captivity in September of 1943, came up with a plan to sabotage Allied forces by infiltrating their ranks with men disguised as American and British soldiers equipped with captured Allied weapons, vehicles and equipment to cause mass confusion and paranoia behind Allied lines. The plan was approved immediately, and given the code name "Unternehmen Greif (Operation Griffin). Part of this plan included the formation of Panzer Brigade 150, a unit formed from all branches of the German armed forces. Originally, the request was made for fifteen tanks, twenty armored cars, one hundred jeeps, forty motorcycles and one hundred and twenty trucks, along with 3,000 men and enough British and American weapons and uniforms to outfit them all. Almost immediately, however, problems arose during the planning stage. First, Skorzeny had only five or six weeks to plan the operation, which limited his available forces and material considerably. Second, of the 3,000 men requested, only 2,500 men could be provided. Of that number, less than ten of them could convincingly speak English, the vast majority having only basic education in English through primary school classes, which they spoke with German accents and with no knowledge of British or American idioms or slang. Finally, there were numerous problems with equipment. Attacks on German rail lines meant that most of the requested equipment would be delayed until well past the deadline for the start of the operation, which greatly limited available supply of Allied material. Of the fifteen tanks requested, only two Shermans in poor condition could be found in time, and far fewer numbers of armored cars, jeeps and trucks were sent to the brigade than the plan had originally called for. Communication problems had also caused Polish and Russian equipment to get sent to the brigade, which would be useless for infiltrating American and British lines. One of the ways which the Germans made up for the lack of suitable Allied tanks was to disguise Panther tanks as M10 tank destroyers by removing their tall commander's cupolas with a flat two-piece hatch, applying sheets of thin angled metal to their hulls and turrets, painting them OD green and giving them U.S military identification marks. These "Ersatz M10's" were intended to look convincing from a distance, allowing them to get in close and strike Allied targets before they could react. The Germans planned to get around the inevitable problem of friendly fire by having the tanks signal their true identities to friendly forces in a number of ways. These included keeping their guns aimed in the 9 o'clock position, the commanders and crew wearing colored scarves or removing their helmets, and identifying markers on the tanks themselves such as a yellow triangle, and flashing blue or red torch lights for identification at night. Despite these numerous problems with material and manpower, Unternehmen Greif would proceed as scheduled on the 16th of December, 1944. The initial plan for the Ersatz M10's along with the rest of Panzer Brigade 150 was to advance behind the 1st SS Panzer Division, the 12th SS Panzer Division and the 12th Volksgrenadier Division until they reached the High Fens, a heavily forested plateau. At that point, they would move around the divisions and split into three units, with the aim of going behind enemy lines and attacking and holding the bridges over the Meuse river at Amay, Huy and Andenne before they could be destroyed by the Allies to halt the German advance. However, for Panzer Brigade 150, Unternehmen Greif effectively ended before it even started. Massive traffic jams had formed during the initial stages of the battle, holding up the entire German offensive. Among these, the 1st Panzer Brigade was delayed and did not arrive in the assembly area for over two days, which meant that Panzer Brigade 150 was delayed from its objectives as well. Skorzeny realized that he no longer had the time required to complete his objectives and rather than continue with the doomed plan, he requested that his forces be used as a regular fighting force and used to take the town of Malmedy. After several attempts to take the town, the Brigade was repelled by American forces and suffered heavy losses from American artillery strikes. Skorzeny was himself one of the casualties, wounded by shrapnel from an artillery shell. One American soldier, Private Frances S. Currey of the 120th Infantry Division, would later receive the Congressional Medal of Honor for knocking out four of tanks with bazooka fire and anti-tank grenades, including at least one of these disguised Panthers, rescuing five of his comrades in the process. This would be the Germans only attempt at taking the town, and Panzer Brigade 150 would later be relieved, disbanded and replaced by the 18th Volksgrenadier Division on the 28th of December. Despite Panzer Brigade 150's failure to achieve its objectives, the overall objective of Unternehmen Greif succeeded to a limited degree. Paranoia among Allied troops led to numerous friendly fire incidents, and false information by a captured commando of a plot to assassinate Supreme Allied Commander Eisenhower in Paris led to his brief confinement. Ultimately, however, this confusion and paranoia had little overall effect on the battle. Numerous damaged and abandoned Ersatz M10's were captured after the Battle of Malmedy and were evaluated by Allied intelligence. No records of what happened to these disguised tanks are available, though it can be reasonably assumed that the tanks were scrapped after their evaluations by the Allies, and no examples are known to have survived to the present day.